This World Cup shooting drill is a fun soccer drill that the younger kids will love. It is called World Cup because you play small tournament style knockout rounds and finish the game with one team standing. Start by placing a goalkeeper in a full size goal. Divide the remaining players into even groups of 3-4 players per group. Give each team a different color and a country such as yellow = Brazil, red = US, white= England etc. Each team will be working together to score and deny other teams from scoring as well. Once a team has scored they take a seat by the goal waiting for the next round. The last team to score each round is out of the game. When you get down to the last two teams 2 goals for one team wins the "World Cup". 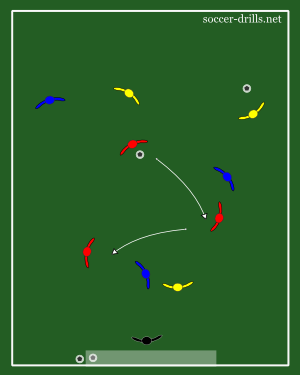 Remember to have fun in this soccer shooting drill.